- This Apple Watch Leather Band is compatible with series 1 & 2 & 3 & 4 and made of classic and comfortable genuine leather material. This band is durable enough for all daily activities and will keep you looking great. The band is adjustable to find the perfect fit that is just your size and comfortable to your wrist. This is the perfect choice for your apple watch leather band. - CLASSIC SQUARE BUCKLE: The silver-tone buckle is made of solid stainless steel, also the clasp pin is enough stable and long, never worry about the middle pin in the buckle disengages easily. Secure your watch with impeccable yet unpretentious style. - Wide Color Selection: Personalize your Apple Watch with this refined leather band. Comparable to the Apple version, but at a more affordable price. - PRECISE CUT HOLES - multiple alternative precise holes fit well for most wrist, standard length just as Apple's original ones. 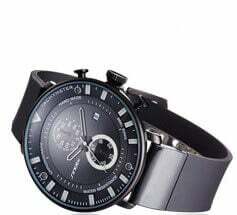 - Nothing at this price is going to really feel like a true replacement to anything Hermès makes, but if you want the look that comes close, then this is the band you ought to get. The Leather isn't going to be as nice, but when you're spending this little you can't expect that. Still, this band looks great and gives the Apple Watch a luxury look without having the spend luxury money. 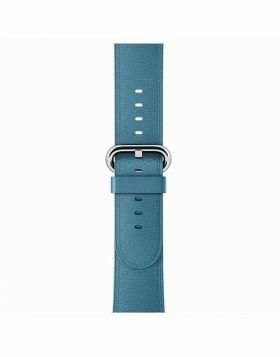 Question:Does the leather band fit the new Apple Watch Series 4? Question: Does it match my silver tone Apple Watch? Answer: Yes, this strap adapter color matched to most Apple Watch finishes.